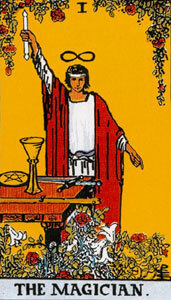 Synopsis: The restored order of the Tarot. 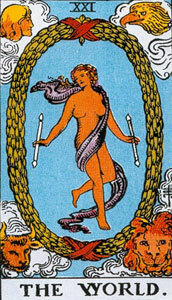 Instead of ignoring the contradictions in reality and replacing them with a private fantasy system which ignores Hebrew tradition, changes the underlying meaning of the symbols and introduces confusion all over the place, we can now consider the possibility that the contradictions exist and our perceptions of reality (the inherited system) need to be altered, just as Strength and Justice needed to be switched to conform to their obvious astrological symbolism and correct Yetsiratic/formative attributions. 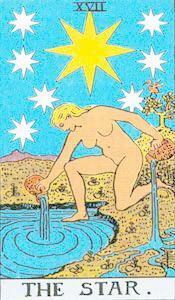 Then it is possible to break with a false tradition and experiment with alternatives to canonical wisdom. 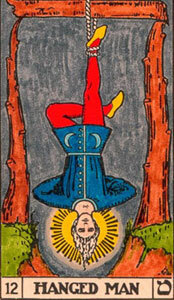 The Magician is moved from Bayt and restored to Raysh, 200, where the role of thought in the Univeral container is apparent. The Sun is displaced to its natural position, a level higher in the containment scale (2-20-200), to the existential Kaph (20), moving the Wheel of Fortune to its more logical position as corresponding to letter 3, Ghimel, archetype of organic movement. 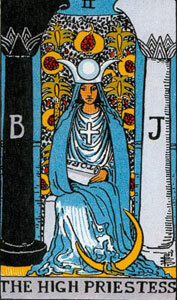 The High-Priestess is returned to her proper home, Tav, which forms the cross on her chest and Moon lying at her feet, symbol of the ultimate resistance to life/death and final sanctuary of all energy. 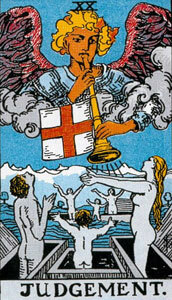 The veil hides Tav's equal partnership with Aleph, and the heresy of endogenous creation. 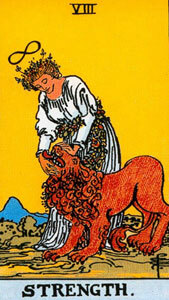 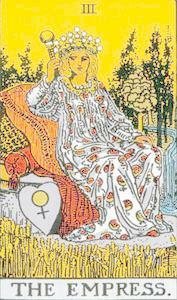 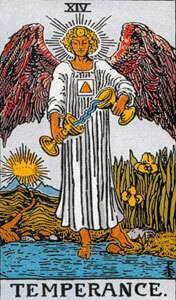 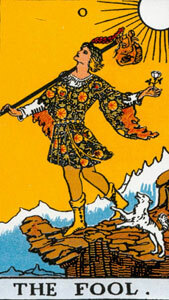 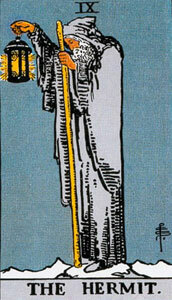 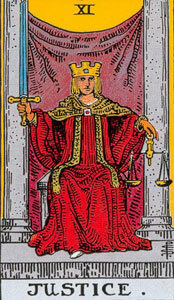 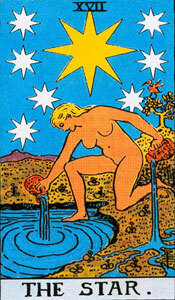 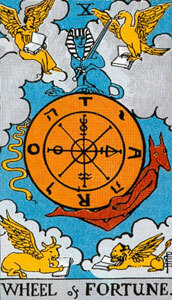 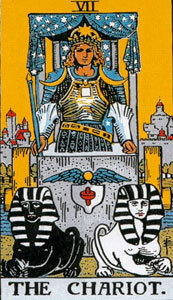 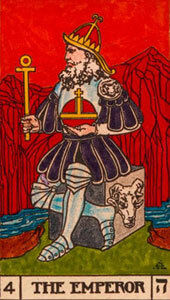 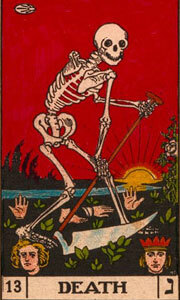 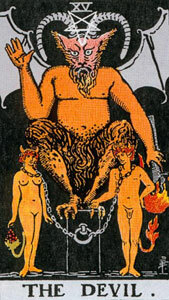 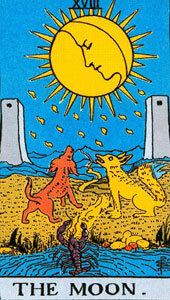 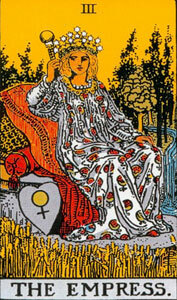 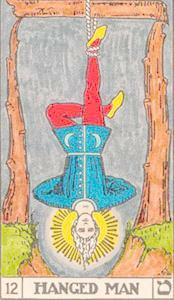 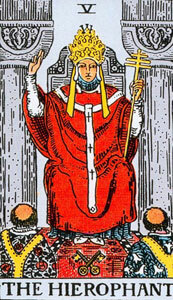 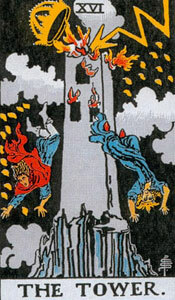 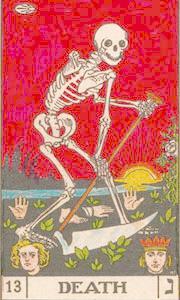 Then The World with its primary and unique symbol (as the only enclosed card, containing a figure holding two wands) of containment/dwelling-in, can be restored to its position opposite The Fool, and the relationship of Aleph and Bayt better understood. 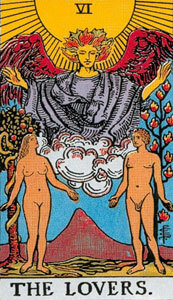 The Kabbalah is the doctrinal essence of the Torah, the repository in the heart of Judaism of the 22 mysteries hidden since the beginning of time. 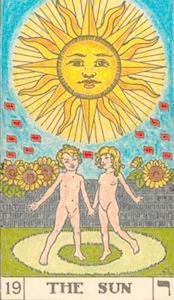 Leo Schaya, The Universal Meaning of the Kabbalah (Penguin Books, 1974), (p. 19).